Kylie knows first-hand the nuances of psychosocial disability, having been in hospital 34 times in the last three and a half years. During this time she has seen this so-called “invisible” disability impact all aspects of her life ­- her confidence, independence, social inclusion, family relationships and everyday tasks. The National Disability Insurance Scheme (NDIS) is a new way of supporting people with psychosocial disability. While the NDIS is not a panacea, it can help people with psychosocial disability get the services and support they need to live better lives. 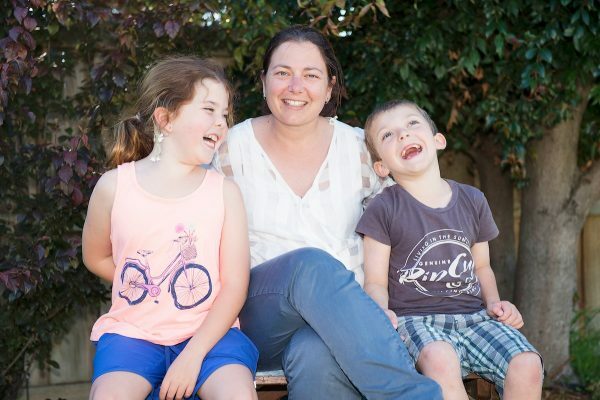 For Kylie, who joined the NDIS three years ago, the Scheme has provided certainty and continuity of funding for the supports she needs, as well as choice and control over who provides them. In fact, the whole family – including Kylie’s husband Rodney and children Millicent, eight, and Ewan, seven – have benefited from her involvement with the NDIS. “Having the extra support in place – including regular contact with a support worker, weekly check-ins from a coordinator, and encouragement to get out into the community and take part in group activities – has improved my mood and helped me engage more with my children and husband,” Kylie said. Kylie’s NDIS plan funds access to a support worker for two hours a week to support her with ordinary activities including housework, shopping, and attending appointments. “I need that control and independence; not to have things done for me but sometimes a little bit of assistance helps when I can’t manage,” she said. More recently, Kylie has been able to access funding for transport. “Now I can get to and from appointments by myself, which is really good for my confidence and independence,” she said. “One day I said to the kids ‘come on, let’s go to town’. That was the first time in three years I could take my kids out on my own because my confidence had improved so much. Kylie regularly attends art classes organised through mental health and disability support organisation Wellways and recently showcased her work in a Melbourne exhibition held for Mental Health Week. Kylie’s piece was a collage about destigmatising mental health. “When I saw my work displayed it was such a good feeling. I didn’t win but mine was displayed next to number one so that was pretty cool,” she said. Kylie recommends that anyone nervous about accessing the NDIS takes a support person and some pre-prepared questions to their first meeting. “The next most important thing is finding a support organisation. I chose to go with Wellways and since then they’ve worked as an advocate on my behalf. They are very client focused. “The biggest benefit for me is knowing what I can actually get out of the NDIS from a perspective of services rather than not understanding the whole process. My plan review really cemented the services that I needed and I’m really looking forward to my next review. Kylie’s goals for the year ahead include continued engagement with her family, reducing social isolation by increasing community involvement and helping others as a peer mentor. “Mental health touches more people than you think,” Kylie said. “Your journey is your journey, it doesn’t matter who you are or where you’ve come from, everyone deserves to be here and if I can help just help one person reach out and reduce the stigma then I’ve done my job,” she said.